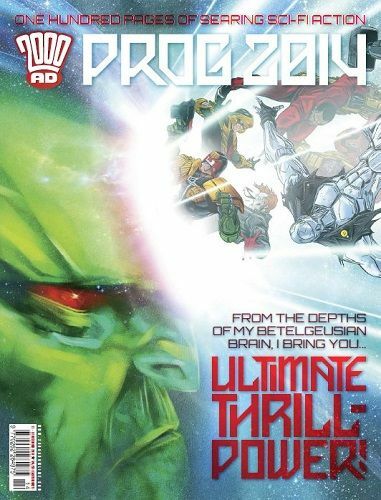 Celebrate the Xmas festivities with the 100-page Prog 2014, a mammoth blow-out of stunning stories featuring a stellar line-up of talent. Civil war explodes as mutants battle norms in Strontium Dog: Dogs of War by John Wagner and Carlos Ezquerra; a former member of war-droids the ABC Warriors reveals his past in Return to Mars by Pat Mills and Clint Langley; maniac-for-hire Ulysses Sweet takes a job that only an arch-psychopath could handle in Centred by Guy Adams and Paul Marshall; grab a glimpse into Inspector Harry Absalom's early days on the force in Old Pal's Act by Gordon Rennie and Tiernen Trevallion; hitmen Sinister Dexter are on the run across Generica courtesy of Dan Abnett and Carl Critchlow; the last surviving Ten-Seconder fights to get back home in a special epilogue story by Rob Williams and Edmund Bagwell; plus a special festive Judge Dredd tale featuring the art of Batman Incorporated artist Chris Burnham! All this and much more!